Ahh! One of my favorite vegetables is Brussels sprouts. These little green cabbage looking things are wonderful as long as they aren’t over cooked. Truth is you either love them or hate them. I stand firmly in the love category. They grow on a large stalk and if you can find them on the stalk, buy them that way. The first time I found them on the stalk, I grabbed it, brought it home only to realize the stalk was way too big to fit into my refrigerator. Considering the size of the stalk, I must have been insane at the market when I thought it would definitely fit into the fridge. Later I realized the stalk can sit on the counter in the kitchen for a few days, while they get eaten up in various dishes. Brussels sprouts can be steamed, sautéed, baked or roasted, or pickled. You can use them in soup, as a side dish and in salads. I adore them with Italian dressing and Parmesan cheese. You can cook them whole, cut them in half or “shave” or shred them into thin slices. There are even Brussels Sprouts with chocolate. And of course, don’t forget, you can always add bacon. My preference is to use fresh sprouts but if you can’t find fresh one and you absolutely need to have Brussels sprouts, frozen will do in a pinch, although not nearly as wonderful as fresh. 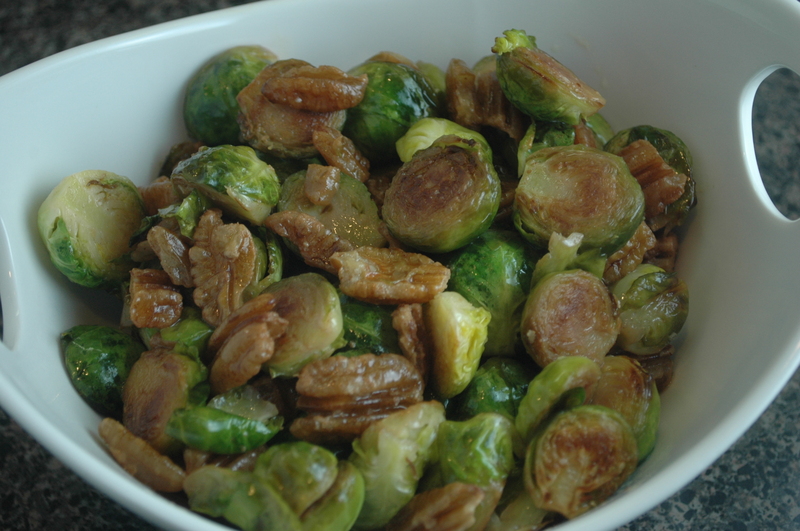 The following recipe is a simple delicious way of serving Brussels Sprouts. Trim sprouts and cut in half. Rinse under cool water. Heat a saute pan, add oil. Place the sprouts cut side down in the pan. 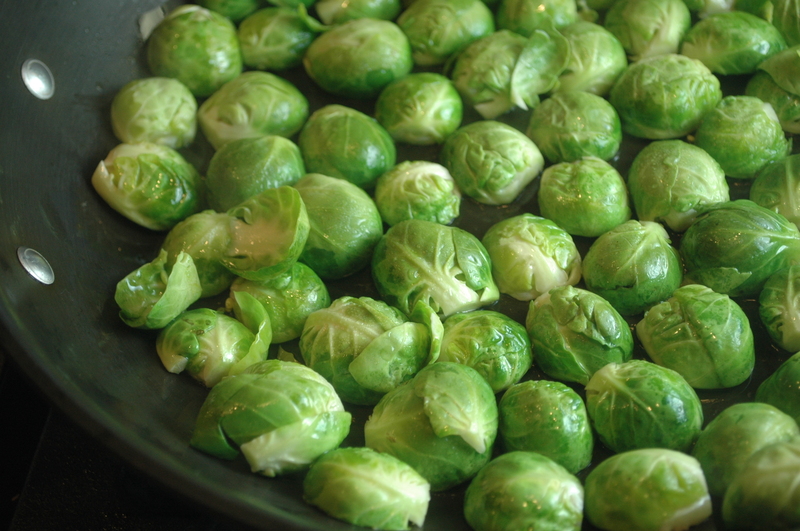 Allow the cut sides of the sprouts to become golden brown, not black and not pale green but a nice golden color. 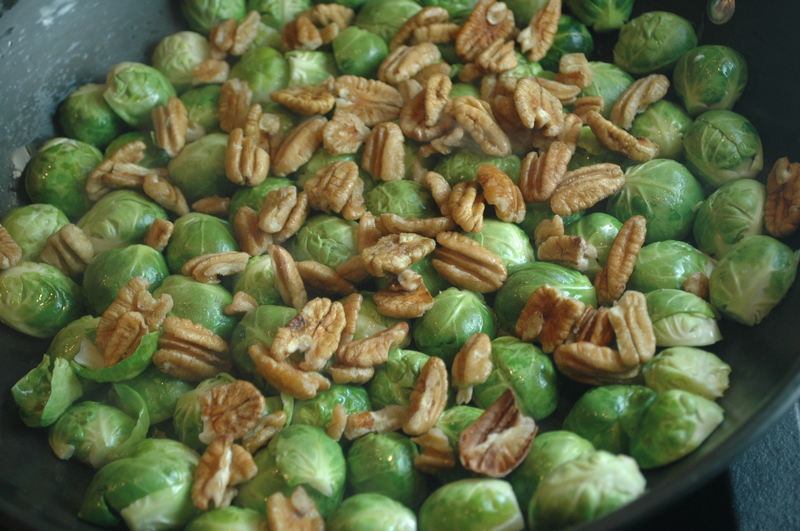 Place the pecans over the sprouts as they are browning. 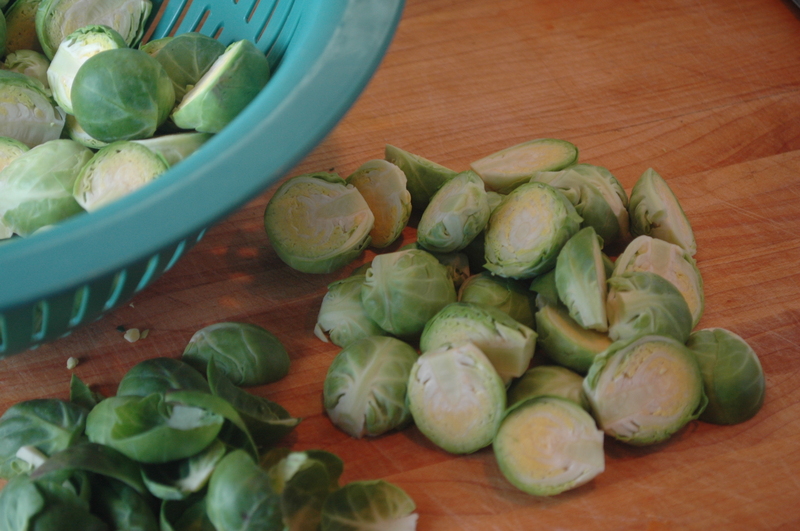 Once the sprouts have developed the color, stir the pan and add the water to steam the sprouts. 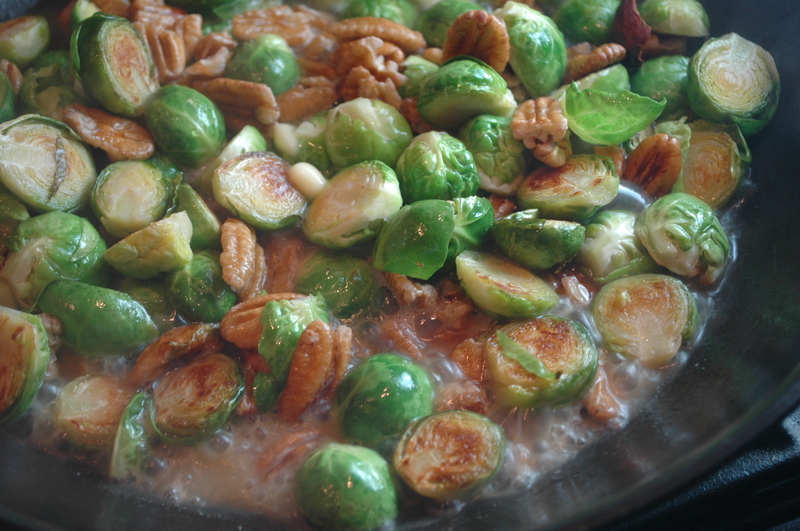 Simmer until the water has evaporated; add butter and stir to glaze the nuts and Brussels sprouts. This entry was posted in Recipes, Southern Cooking and tagged Brussels sprout, cook, how to cook Brussels sprouts, Parmigiano-Reggiano, pecans. Bookmark the permalink. 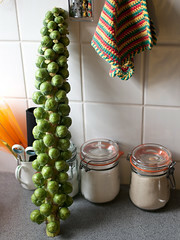 That is a giant stalk of brussels sprouts! They are definitely one of my favorite vegetables. I usually just roast them in butter, but am always on the lookout for new ideas, and yours sounds delicious and simple! I have heard of roasting them on the stalk but I would think you would need one HUGE oven to do so and have a large crowd to feed. i am looking forward to checking out your blog. . . Toast and tea are some of my favorite things! Oh, haha, my comment may have been confusingly worded. I do take them off the stalk before roasting – I had no idea one could leave them on, but I would guess the stalk isn’t edible! And thanks for checking out my little blog :). Thanks for checking out mine too. Yours inspired my breakfast – cinnamon raisin toast and tea. I spy some Brussels Sprouts there along side of your quiche! Yay! Eat more Brussels sprouts! This is my favorite winter vegetable. You are right, it should not be overcooked. I always keep a close watch when cooking it. Here in the South, they often will cook them to death, leaving them soft and mushy (with bacon added). While not the best, I love Brussels Sprouts so much, I’d even eat those with gusto. ops… can’t stand their smell. yours look lovely anyway.